The Wheeling Alternative - Why do incumbents served by small-market media seldom lose elections? The "WEB EXCLUSIVE" is on Wheeling's WTRF-TV website. (For some unknown reason, I have difficulty posting their videos. You can, however, watch all eleven minutes of the "exclusive" interview on their website.) A warning: there are no pointed questions just softballs that allow McKinley to deliver 11 minutes of Republican talking points. I don't expect a reporter to ask all tough questions, but how about just one: didn't President Trump say to Nancy Pelosi that he would be responsible for the shutdown? So I will take the mantle. I will be the one to shut it down. I'm not going to blame you for it. 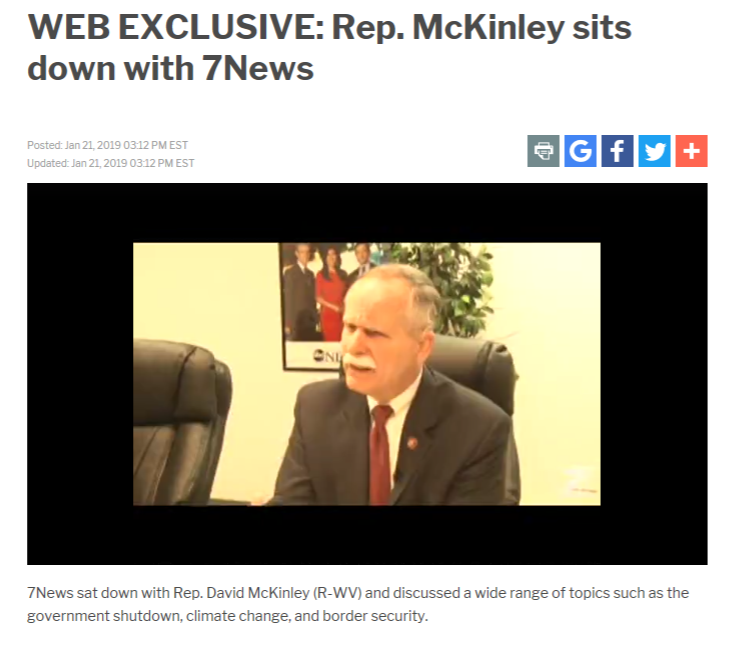 "If Nancy Pelosi would just simply go public and say for the next 30 days or so, we will negotiate fairly and honestly, then I think we would open up government," Congressman McKinley told 7News. "But, no one trusts her. It's a matter of trust. So, that's why we have to keep it closed, why Trump wants to keep it closed. We've got to get this thing resolved and we have a tool now to get this thing done. Channel 7 is a CBS affiliate. Why does the picture behind McKinley have the ABC News logo on it? I'm assuming those are news anchors in the picture but none of them look like those on Channel 7. Why aren't WTRF's anchors in the picture? We never get to see who is asking McKinley the questions (which is highly unusual for this long of an interview). The interviewer's voice is unfamiliar to me and at one point he says that he has a background in electrical engineering. I checked the bio's of our local reporters and none mention electrical engineering. Who is doing the interview? My hunch is that WTRF did not do this interview. McKinley mailed it in from somewhere, the station ran it and took credit for it. All parties are happy: McKinley gets lots of non-critical coverage and WTRF fills up part of its newscast. With Ogden and WTRF, you just gotta love Wheeling media.